Walking Solo: The Plateau, Mile-End and Park Avenue. Sometime this week I decided to go out for one heck of a long walk. I wanted to walk for so long my legs would feel numb. I was lonely and kind of in a funk and I just needed to get away from it all. Kind of trying to run away from my life problems for a little while y'know? Walking was my way of dealing with the way I felt last year, and it's helping me deal with the new problems I'm facing this year. Losing my job was tough. I loved my job; I loved what I did and I was proud of it too. The circumstances under which I lost my job were also very frustrating, to say the least. So, I was in need of a really good long walk to help me take it easy and chill. I got off at the Berri-Uqam metro station and walked up Saint-Denis. 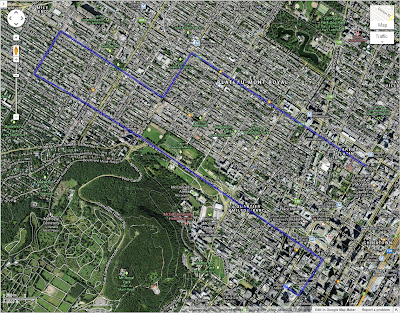 Took a turn on Mont-Royal and headed west 'til I hit Saint-Laurent and went north. I thought I'd visit the Mile-End one more time. I've come to like that place quite a bit because of its neighbourhood feel and because it's still not as flashy and pretentious as the Plateau yet. But, while I was walking around on Mont-Royal, I saw something incredible: a scooter. Yeah, but not just a scooter. 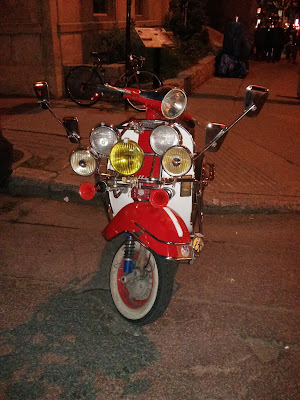 It's the single most awesomest scooter I've ever seen. Here are some shots of the bike and let me explain just why it's so awesome. 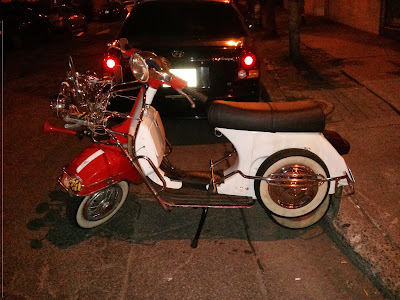 First of all, yeah it's an old scooter; looks like a classic Vespa. In the first picture, you notice how the owner added a whole bunch of mirrors and lights and horns on his bike, right? It's like the dude just went crazy and decided to put enough mirrors to simultaneously check out the booty of half a dozen chicks he just zoomed by as they're recovering from partial blindness caused by the flash of lights from all the headlamps. In the second picture you see the spare tires and extra chrome pipes going all around the bike. 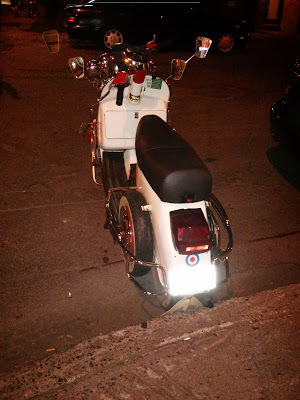 That was not standard on these bikes, nor was it available at all on any stock Vespa. But, the most crucial detail is in the third picture; the one where you see the back of the scooter. Notice, just below the brake light, there's a little bulls-eye symbol there. That is the Royal Air Force roundel. The genuine symbol of the modernist subculture, also called the mod subculture. The mod subculture originated in London, England after the second world war and became really popular around the mid 60s. Basically, the trend involved tailored suits, bomber jackets, listening to music from bands like The Who and of course, customized scooters. The Royal Air Force logo, I heard, became their symbol because a lot of the kids who followed that trend were from families that served in the second world war and whose father had served in the RAF. Also, the patches added a certain edge to their bomber jackets as well among all the other patches they would put on there. The term modernist though initially came from fans of modern jazz music. Originally it was all about wearing modern Italian clothes, but that changed a bit over time and in the late 60's the subculture was slowly taken over by skinheads. They weren't racist or white supremacists or anything like what we've heard of in the media or in movies. It was a new trend where people would get a really short haircut or shave their heads and where the fashion was inspired a bit more by the Jamaican rude boy street culture. Oh and lets not forget the Dr Martens boots! How I became aware of this subculture is actually through a graphic novel that I bought last year called The Deadenders, written by one of my favourite comic book authors, Ed Brubaker and drawn by Warren Peece. The story has a lot of mod subculture references, especially among the main characters who are scooter-riding kids in a post-apocalyptic wasteland, stuck in permanent darkness because of an unexplainable dimension-altering cataclysm that happened in the past... or something. Anyway, I highly recommend that graphic novel. It's an awesome story with great artwork. Anyway, I would've love to meet the owner of that scooter and have a chat. I'd be curious to know how he got the idea and what's his/her background. 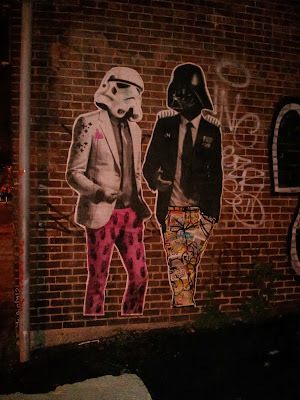 A little further in my walk I came across a new graffiti that I hadn't noticed before. It's okay, but the whole stormtrooper-Darth Vader helmet thing is getting a little old. Ok, we get it, Star Wars is cool and it's funny to imagine one of those characters doing something else except getting shot by Han Solo or without a leather suit and cape, force-choking an officer. Seriously, try harder. 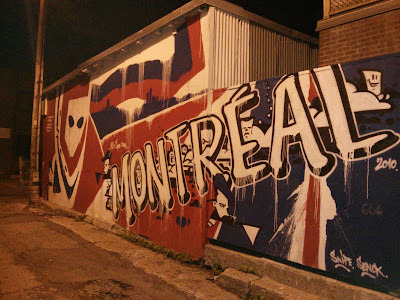 When I was walking up Saint-Laurent, I stopped at some point to check my phone for a message and as I was looking around waiting for something to load I spotted another graffiti. This one I know I've seen somewhere in a picture, but I could not put my finger on it. It's the weird mask-face-thing that I recalled from somewhere. I thought I'd take a pic and hope that someone could tell me where this could've been displayed before. It's a sweet graffiti what with the colours of the local hockey team and such. And the way it's drawn is very street, if that's any kind of adjective you can use. 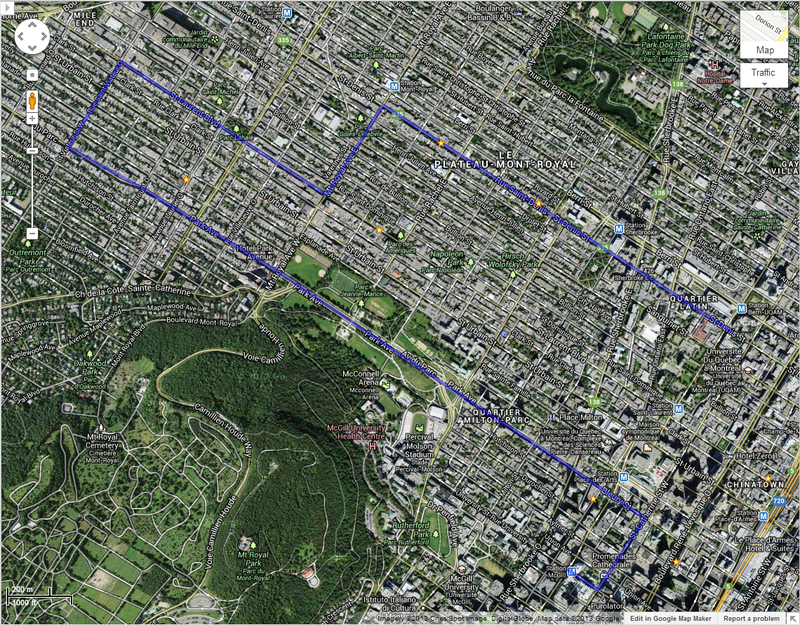 I eventually reached up Saint-Viateur and turned on it until I reached Park Avenue, or Avenue du Parc. Then I started coming back down again towards downtown. I never really walked down Park Avenue long enough to take notice of anything particular. There's a great little cupcake bakery there that I love called Cocoa Locale held by this single young lady who makes the single most delicious dark chocolate and raspberry or orange cupcakes you'll ever have. (I'll walk by it and take pics and talk about it in a later post. Promise!) But, it was late and everything was closed so I thought it would be best to come back and take pictures during the day and talk about that street in a future post. One place got my attention though. 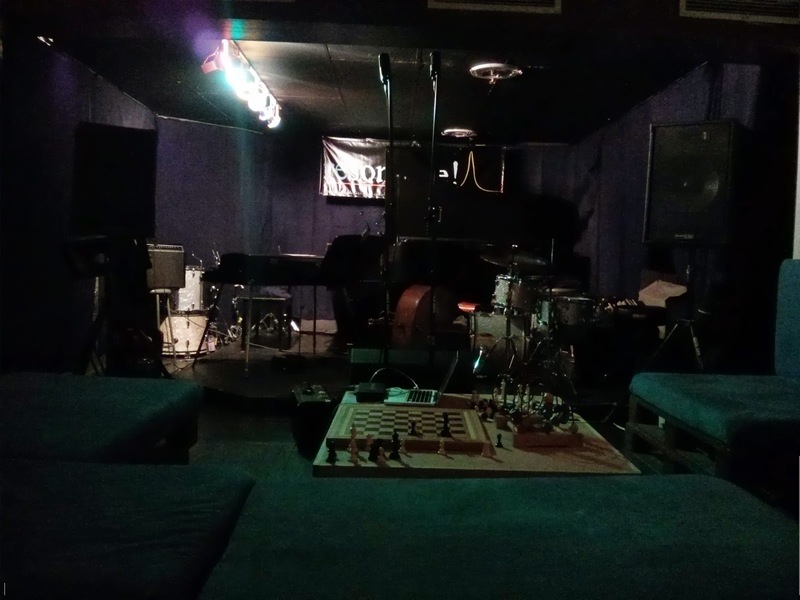 I was walking by this small place in a basement and it had really nice smooth classic jazz music, which I really enjoy and find most relaxing. Contrary to many other jazz places in Montreal like the Dièze Onze, the Upstairs Jazz Lounge or the House of Jazz which are a bit upscale and where I wouldn't go wearing just a t-shirt & jeans, this place was pretty laid back and casual. So, I stepped in to take a look. It was a little vegan café with a small stage at the back for jazz bands to play! It was a nice cozy little place. As I walked in there was the smell of spices like cardamon and curry mixed with the coffee. I decided to take a break and have a cup of coffee. Besides, I still had a long way to go to get back downtown anyway. By the way, they don't serve filtered coffee there; their regular coffee is freshly ground and made in a French press. Now that's my kind of coffee! It was also very delicious to a point that I drank it straight up black. I sat there and sipped on my cup and relaxed to the smooth sounds of trumpets, piano, bass and drums. 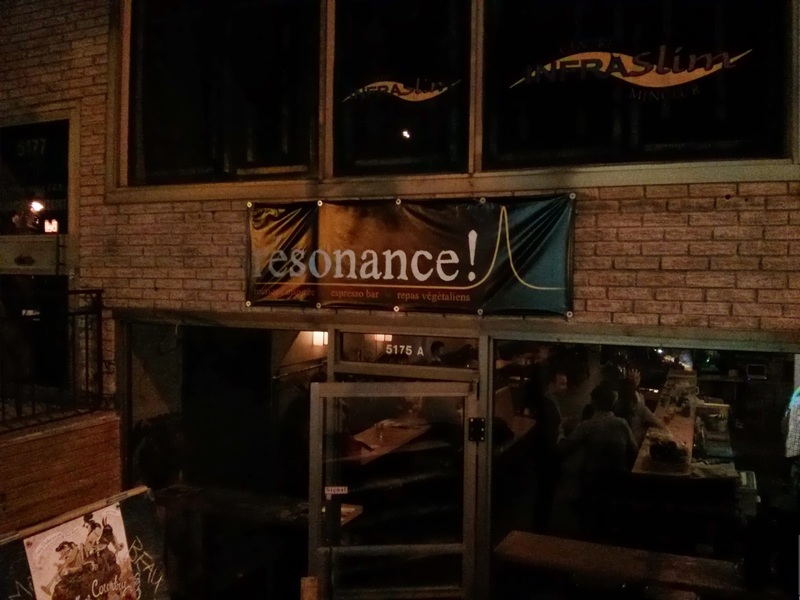 The place is called Résonance and is located on Park Avenue just at the corner of Fairmount. After that I kept on walking towards the city centre along the mountain. The breeze was cool and smelled of freshly cut grass. It was very pleasant. But, not as pleasant as the view you get from the Montreal skyline on that street. 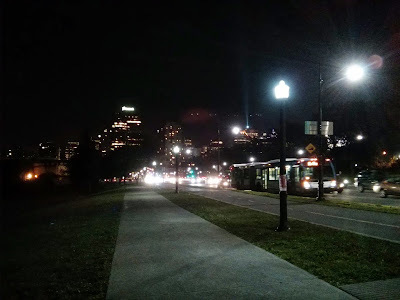 It's the next best thing to climbing up Mont-Royal at night in my opinion. It was a great view and I enjoyed walking down that street very much. Eventually Park Avenue turns into Bleury street and you end up at Place Des Arts. But, that night there was a live show for the Francofolies French music festival and it had just finished. So, I headed a little further west on Sainte-Catherine to the McGill station to avoid the big crowd in the metro and get in one station ahead and finally headed back home. When I got to my place I lied down on my couch for a while because my legs were numb from walking. In total, I walked 8km! That's one heck of a walk.